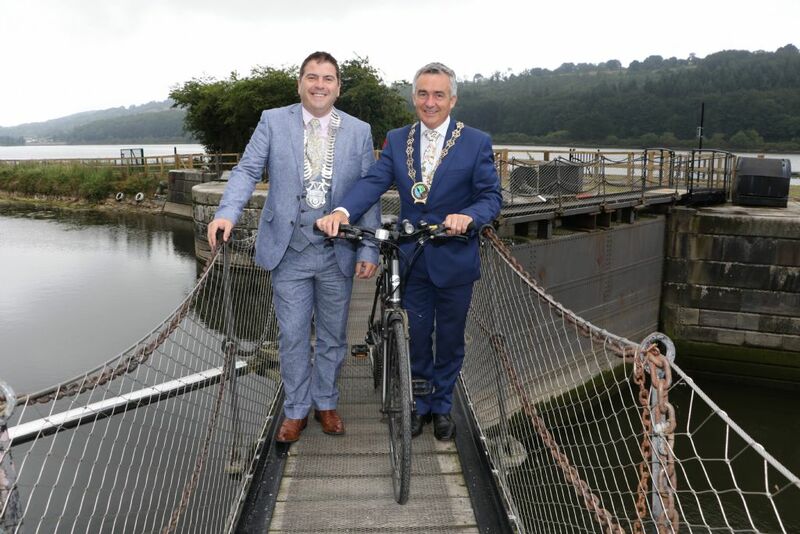 The official opening of the Carlingford Lough Greenway from Newry to Victoria Lock took place on 27 July 2018. Work has been completed on the section of the Carlingford Lough Greenway from Dublin Road Bridge in Newry through the Albert Basin site and along Middlebank as far as Victoria Lock - a distance of 5.7 kilometres approx. This linear section has been open for use by the public from 4 May 2018. Initial funding was secured by Newry, Mourne and Down District Council through the Landfill Communities Fund administered by Ulster Wildlife and DAERA to complete the Greenway from Newry to the Weir on the Middlebank. 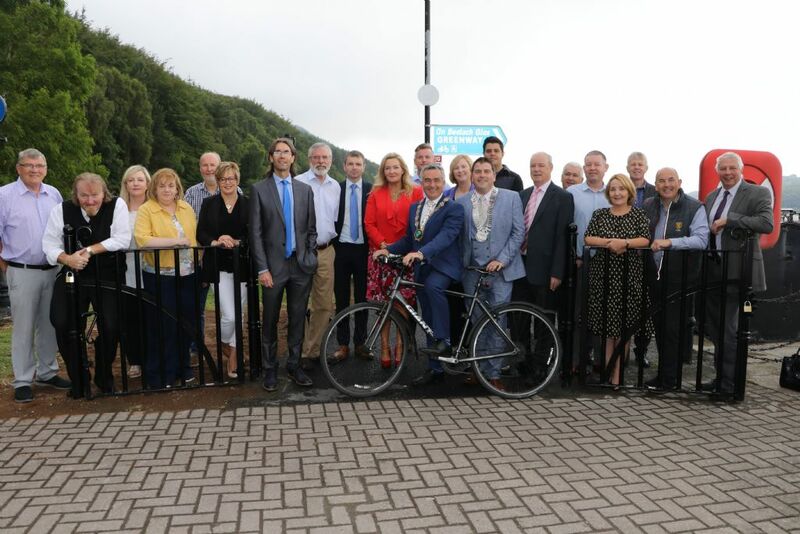 Newry Mourne and Down Council in partnership with Louth County Council and East Border Region then secured funding of 3.46 million euros from the European Union’s INTERREG VA Programme managed by the Special EU Programmes Body (SEUPB), to deliver the Carlingford Lough Cross Border Greenway. Match-funding for the project under the INTERREG VA Programme has been provided by the Department for Infrastructure in Northern Ireland and the Department of Transport, Tourism and Sport in Ireland. The new stretch will build on the recently completed and already popular Carlingford Marina to Omeath Greenway. This scheme is scheduled to be completed in 2020 and will incorporate a Greenway Activity programme to raise awareness of the benefits of cycling and walking. When completed, the Carlingford Lough Greenway will provide a world-class cross-border green travel route. The project will extend for approximately 20km from Newry City to Carlingford, providing a much needed recreational facility for this area. When fully completed, it will link with the existing Newry/ Portadown Cycleway/Towpath resulting in a total length of 52km of greenway along the East coast of Ireland enabling walkers and cyclists to travel off-road between Belfast and Dublin using Sustrans Route 9 (The Great Eastern Greenway). It will see commuters and tourists alike able to travel from Carlingford to Newry on foot or by bike on a scenic, safe and traffic-free route. Newry, Mourne and Down District Council Chairman, Councillor Mark Murnin said, "I would like to pay tribute to the staff in each partner organisation for their foresight and commitment in developing this genuinely cross border project and in securing a significant amount of EU funding for its implementation. I look forward to returning in the future to see the finished greenway which will greatly enhance our cross border region”. Chief Executive of Ulster Wildlife, Jennifer Fulton said, “This project has demonstrated partnership at its best and we are delighted to have helped Newry, Mourne and Down District Council secure funding through their contributions to the Landfill Communities Fund for the first phase of the Carlingford Lough Greenway.